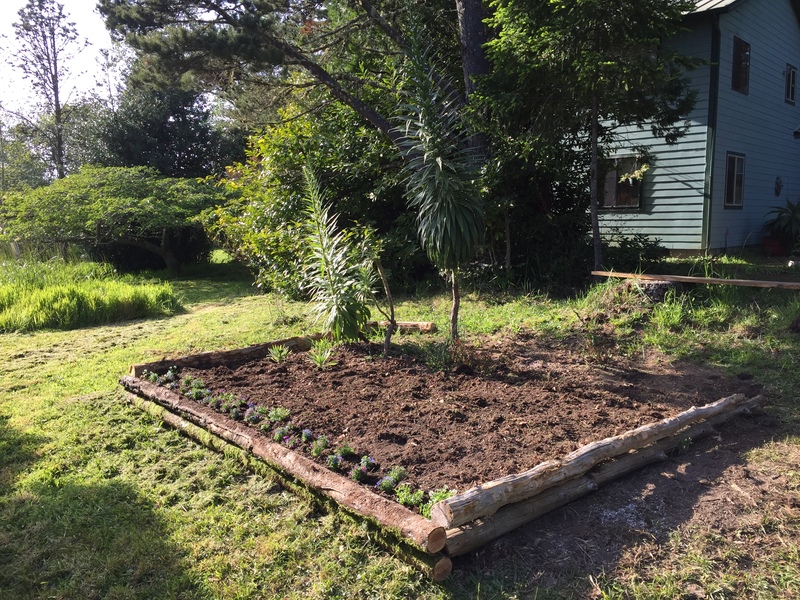 May 3…My wife suggested putting some logs around the new bee-flower echium bed. 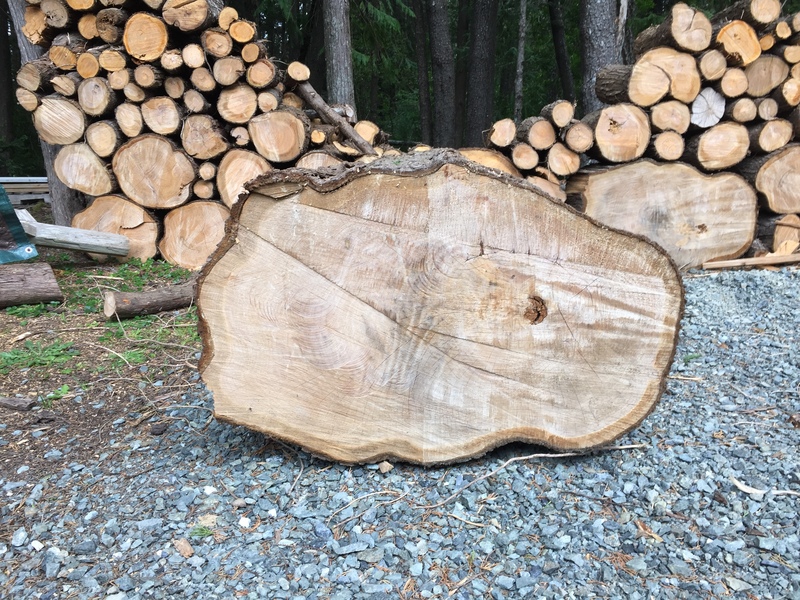 I declined knowing how much work that would be, finding some dead trees that were long and straight enough, cutting them to size, and hack-sawing rebar to hold them in place. You can see who won out, but I think it looks good. 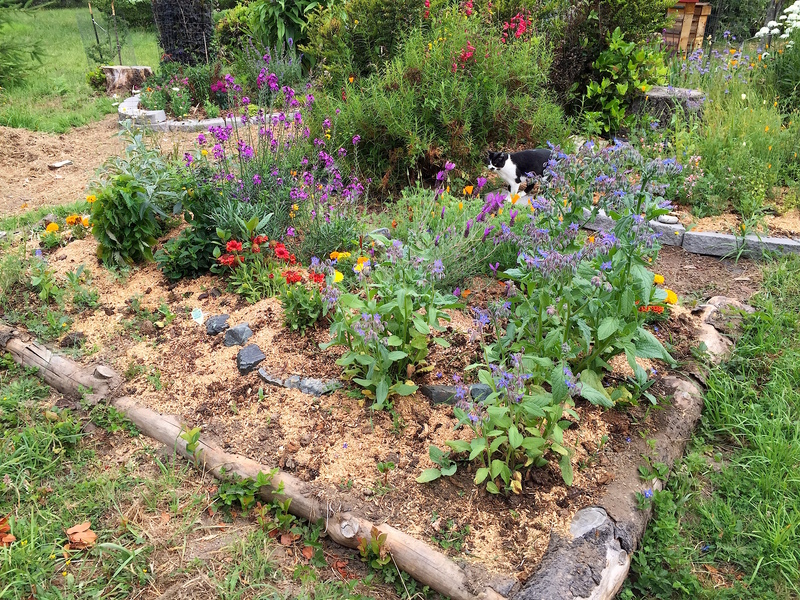 Walker’s Low Nepeta (a real bee lover) will go behind the lobelia, then some thyme, artichokes, and various other bee-loving plants to flesh it out. 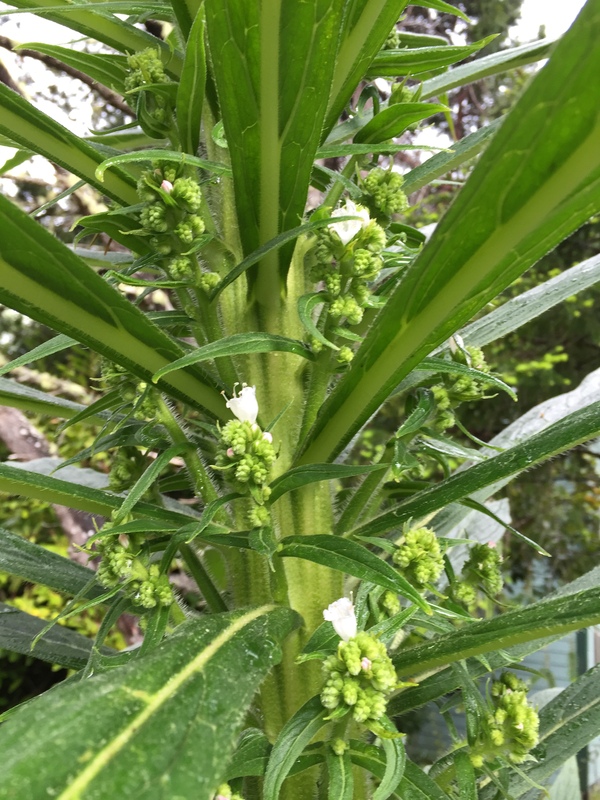 The Tower of Jewels echium has started blooming already. 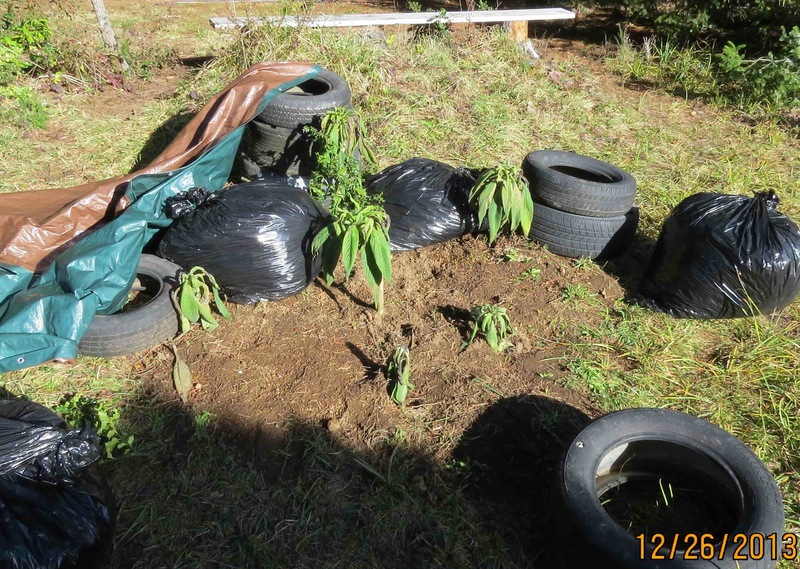 Three plants (out of 6) made it through two winters. 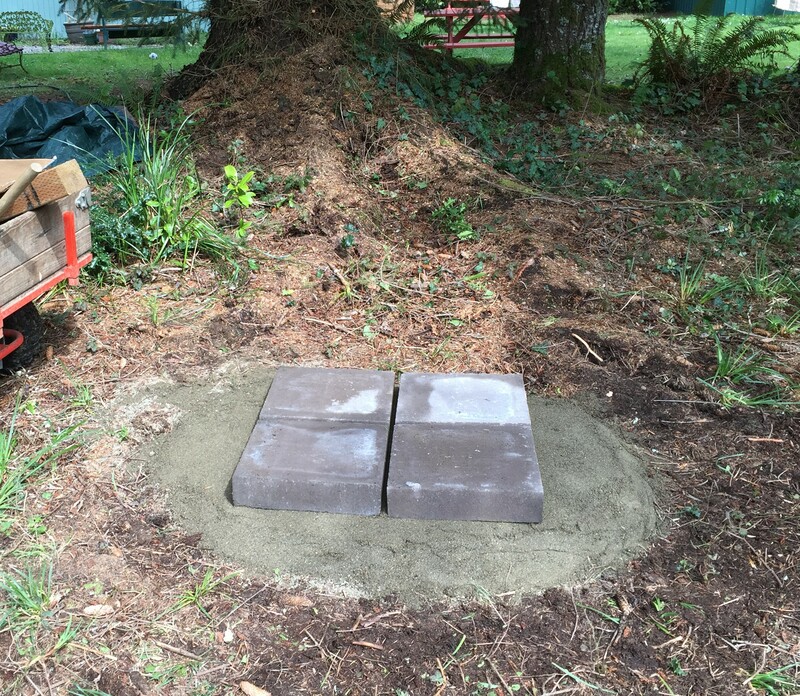 I started this project about a week ago after we decided to improve the neighborhood around the new Grand Kids Log hive seen in the background. 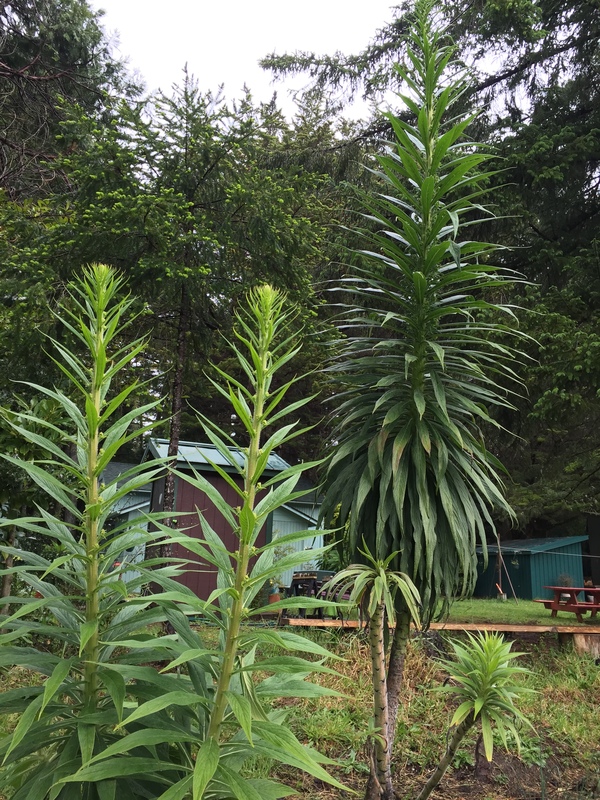 The transplanted echiums shot up recently, 8 – 10 feet. 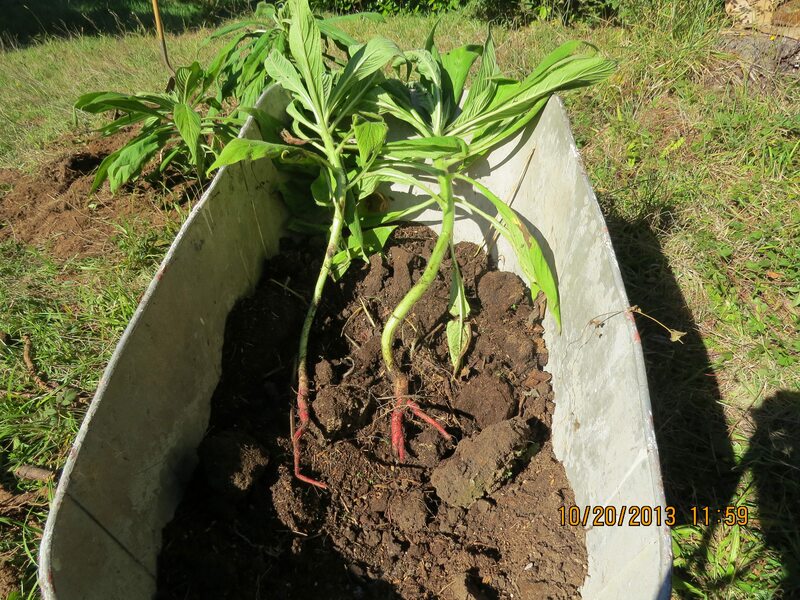 I transplanted six of them in November 2013, but only 3 have wintered through. 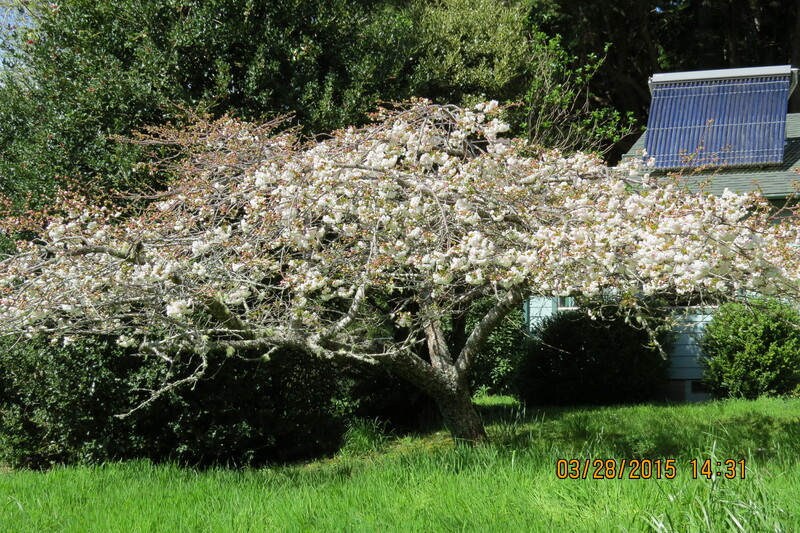 April 29…They are starting to bloom already. 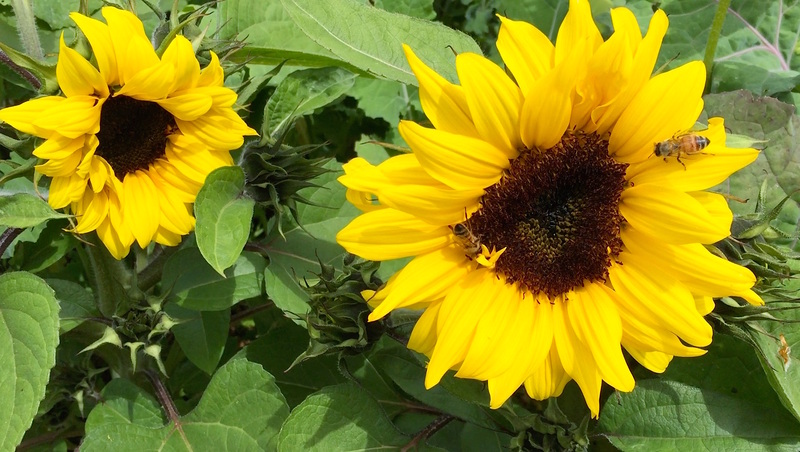 I’m looking forward to watching all kinds of bees partake of the nectar and pollen they will provide. 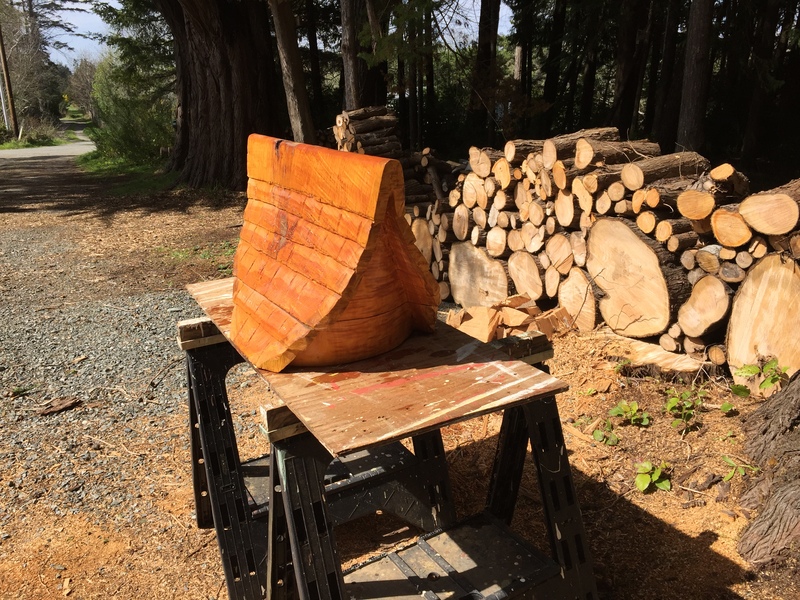 Footnote: I’ve asked my son to practice up his guitar version of “Stairway to Heaven” to accompany my video of it in full bloom. 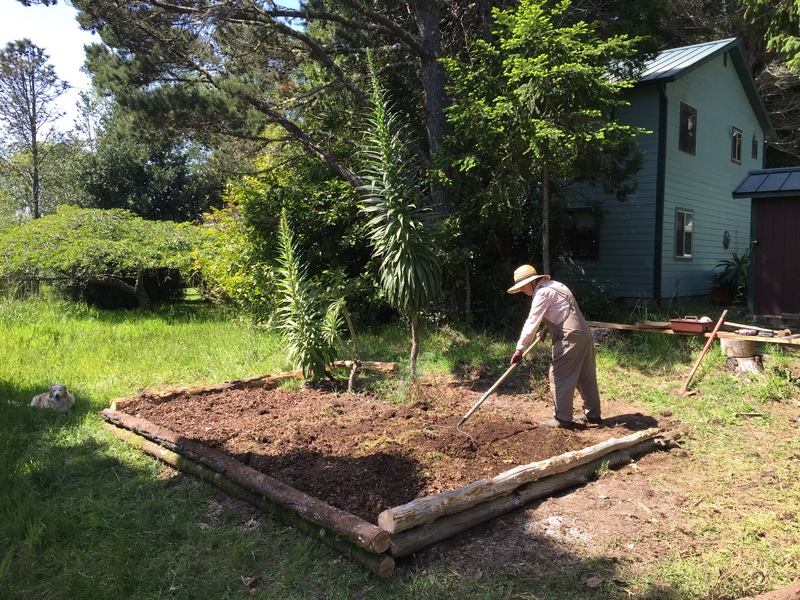 March 9, 2015…you can see how much it has grown in less than two months. 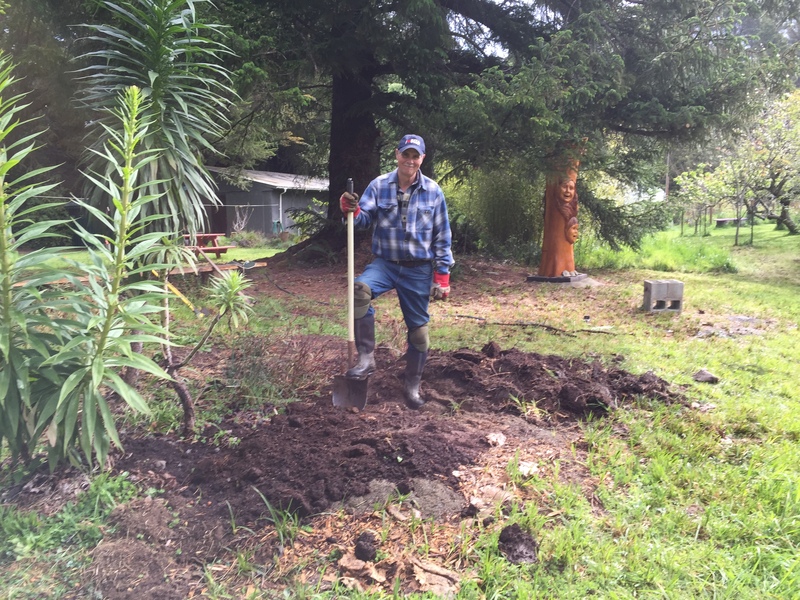 This was taken before we trimmed the branches in the background for the new log hive. 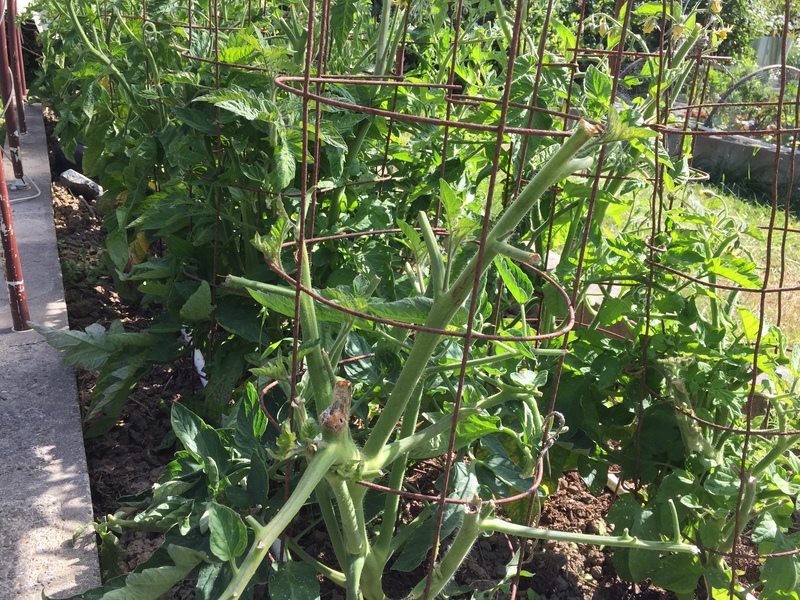 I started this post out as a garden update, but we’re so happy about this new spot for bee flowers, I wanted to post it first. 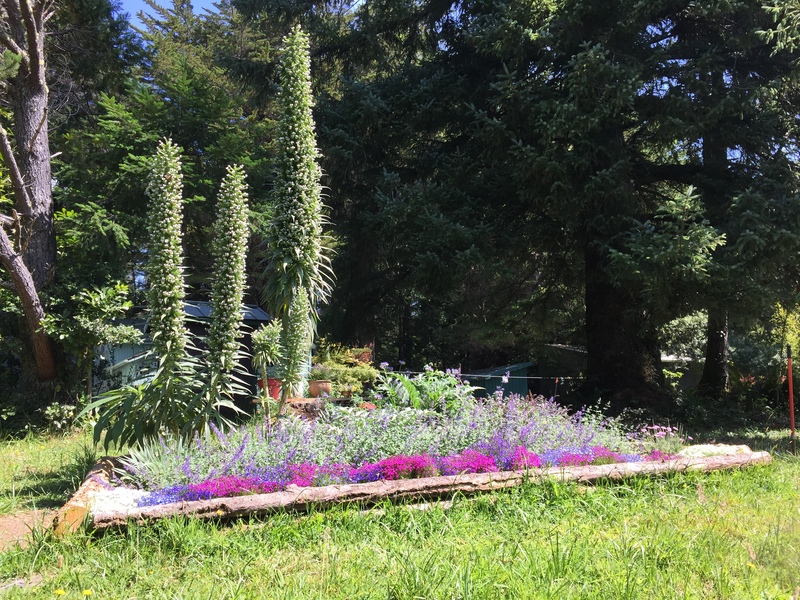 July 14, 2015…The Towers of Jewels echium is standing tall in the background. The other bee plants are filling in nicely. 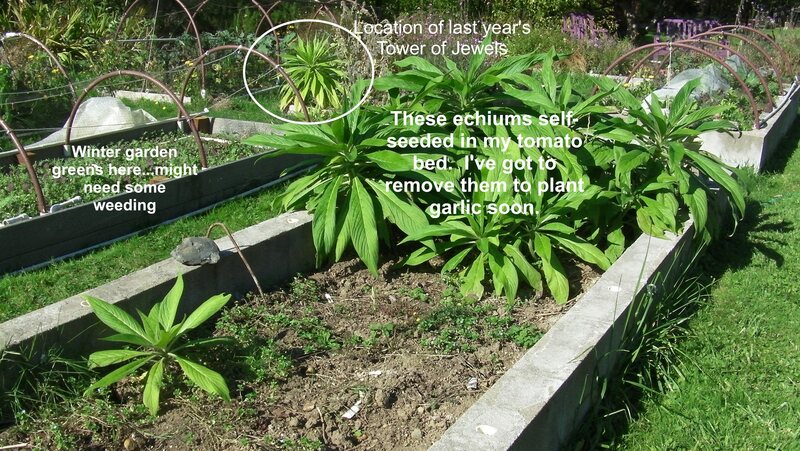 But they ARE echium ‘trees’; more specifically, Towers of Jewels. I spaded the this patch of turf, then kept finding more and more transplants to put in. 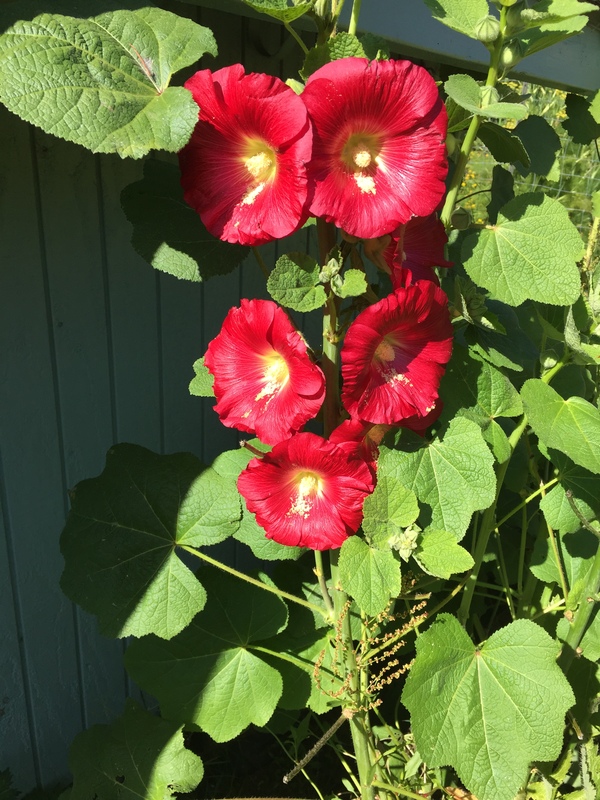 Last year the only one I had grew 10 feet (3 meters) in a single year. 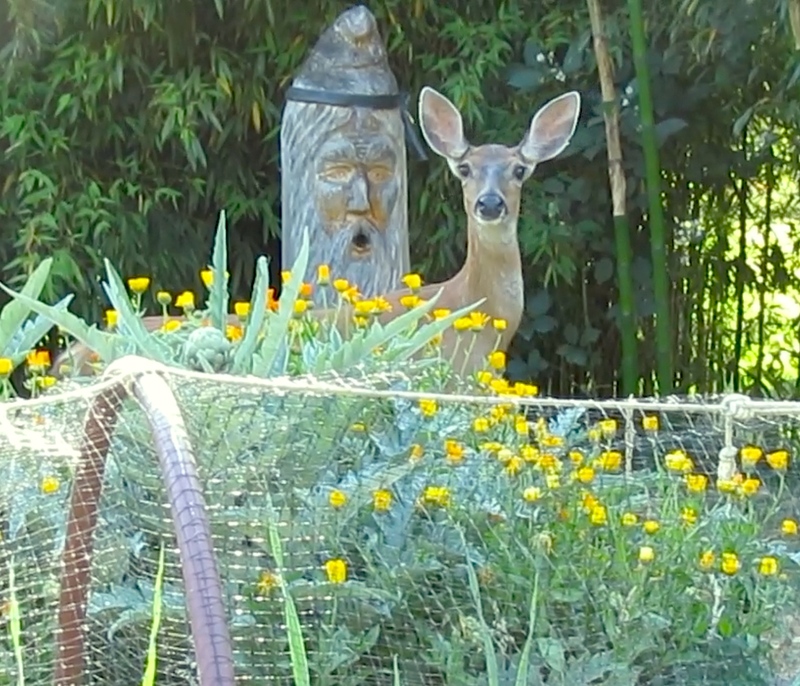 The bumblebees loved it. They worked it mid May til mid September. 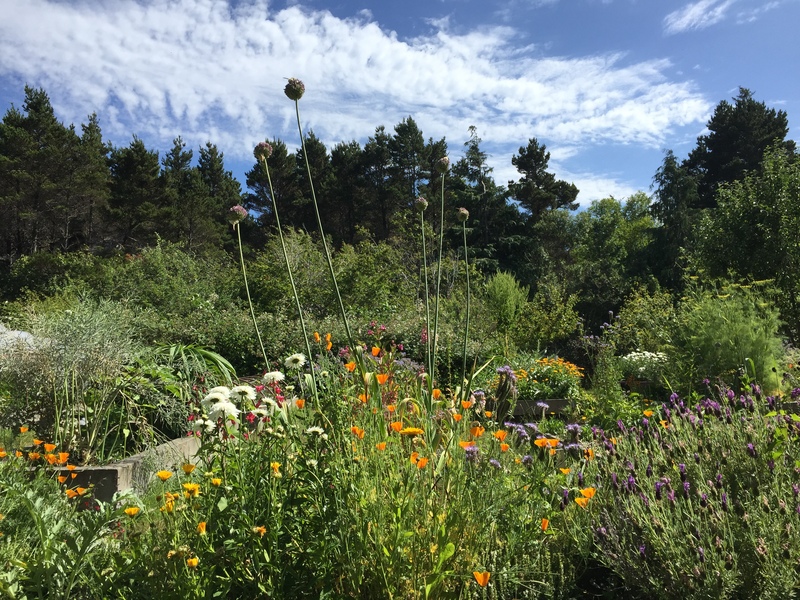 I kept thinking about collecting seeds, then forgot. Not to worry, I’ve got plenty of ‘upstarts’ now. If I ever had any doubts that the Tower of Jewels would throw seeds, those doubts have vanished. 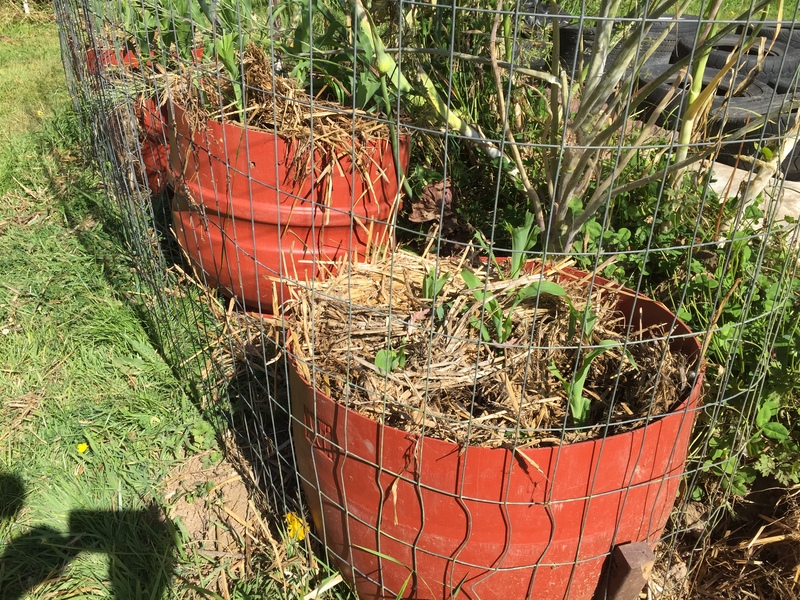 I’ve got to get these out of here to plant garlic. If I don’t transplant them, my wife has threatened to ‘toss’ them. Why? We have so many. 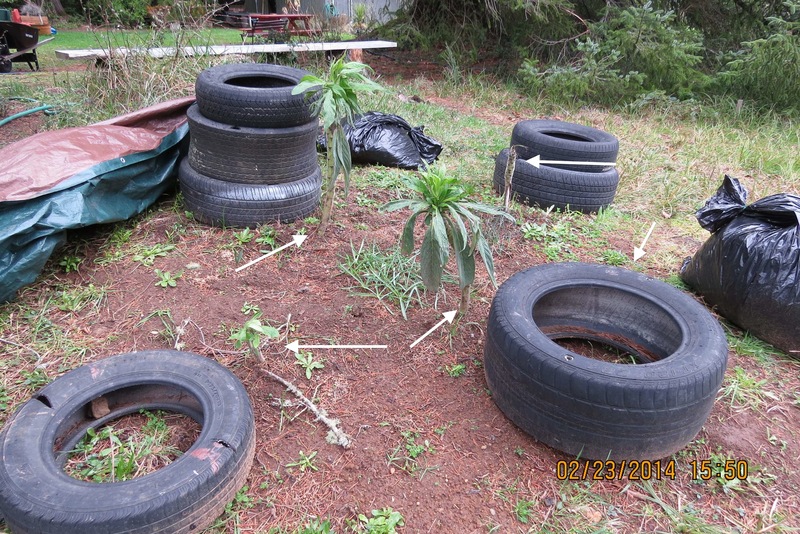 The plants don’t have big root balls. Hope they take. October 20, hummm, they look a little wilty. I better water them. 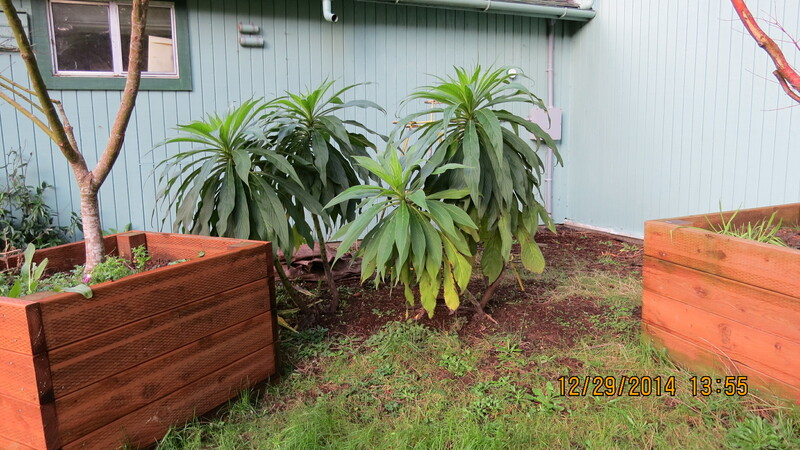 November 9, 2013…They are starting to look better after I trimmed the lower leaves. What are the tires for? They are to hold up a tarp to protect them from freezing. 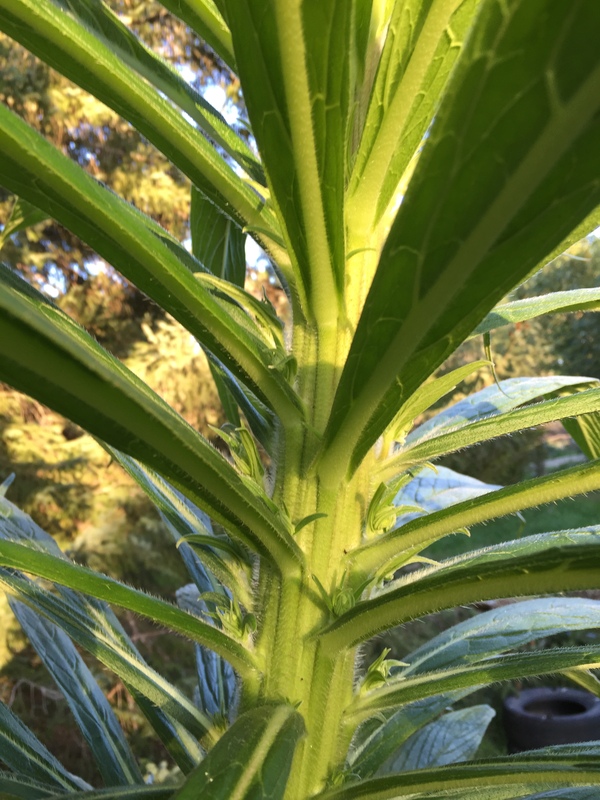 November 13…Echium in the sun, looks good. 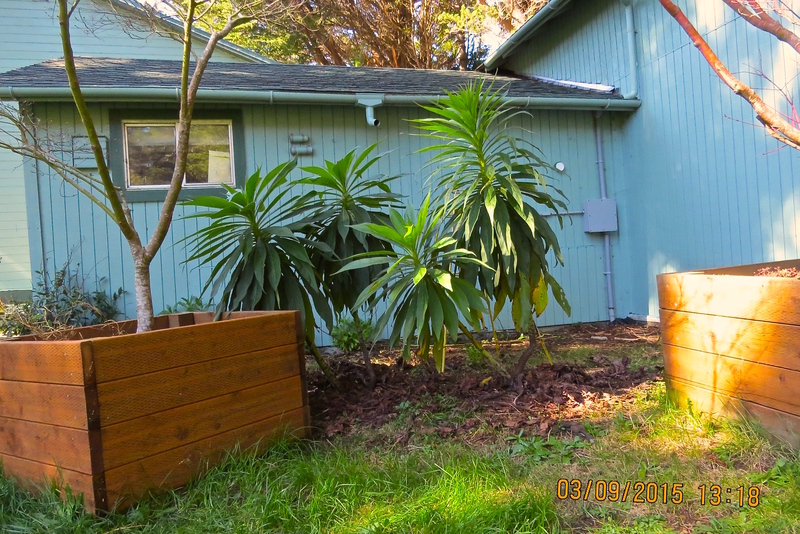 This will be the area I’ll plant some of my “Bulbs for the Bees,” Snowdrops, Winter Aconite, and Siberian Scilla. 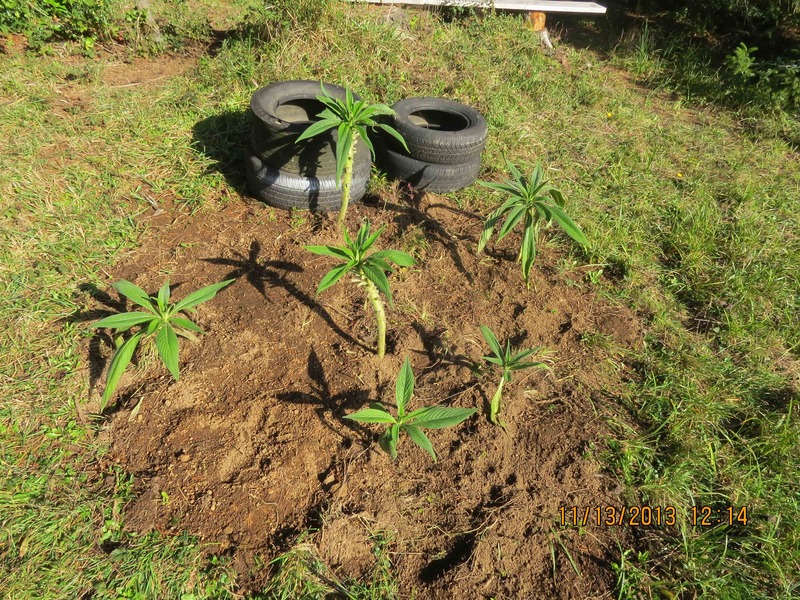 According to Palmbob, at Dave’s garden, trying to transplant it, ends up killing it, but these are still growing almost a month after transplanting. 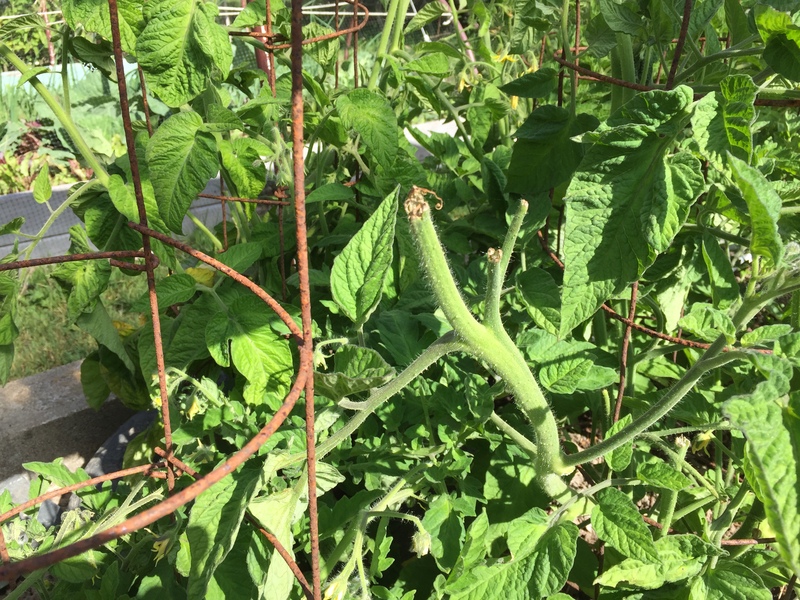 The Tower of Jewels is a member of the Boraginaceae family which includes borage (grows all year here) and comfrey which I planted 40 years ago and is still coming back. 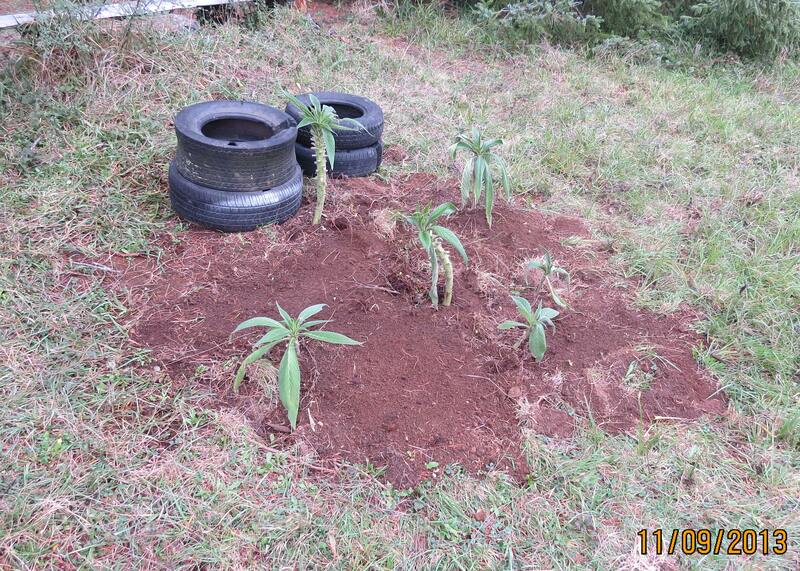 I’m hoping these will grow to be tall nectar sources for bees and butterflies. 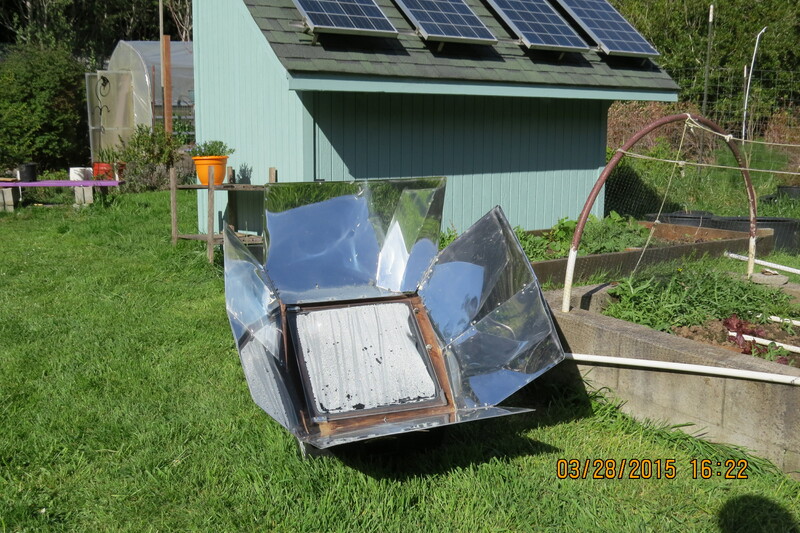 11-24-13…I’ve had to take drastic action for the cold weather. 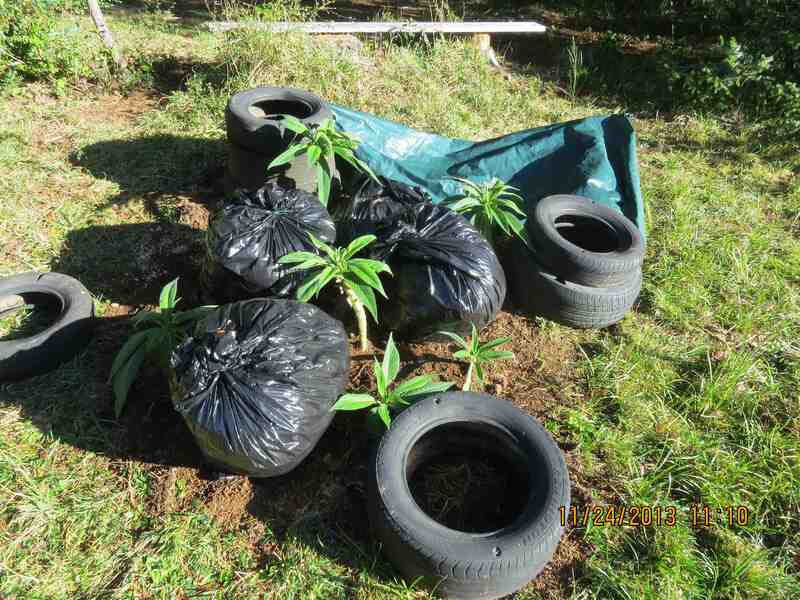 Bags of leaves hold up the tarp, tires hold it down. 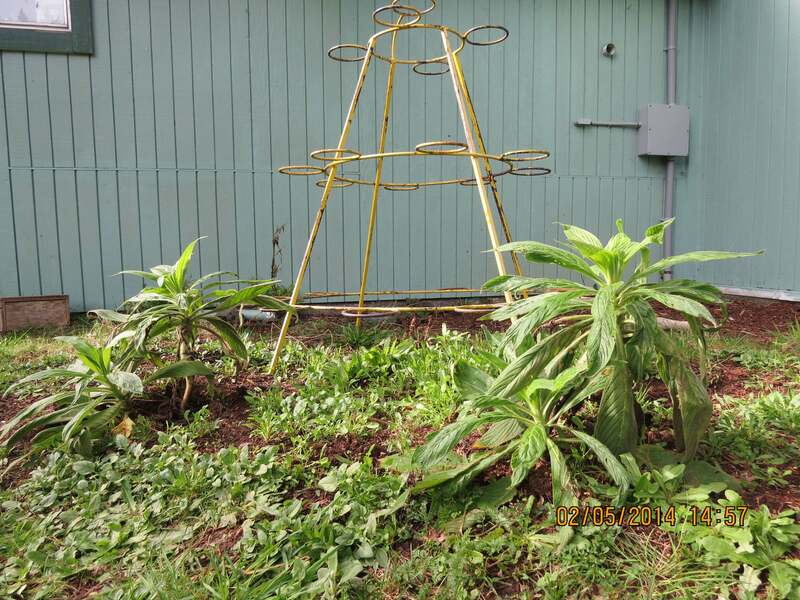 12-26-13…These echium have definitely taken a hit from the sub freezing temps we’ve been experiencing for a couple of weeks. I hope they make it. 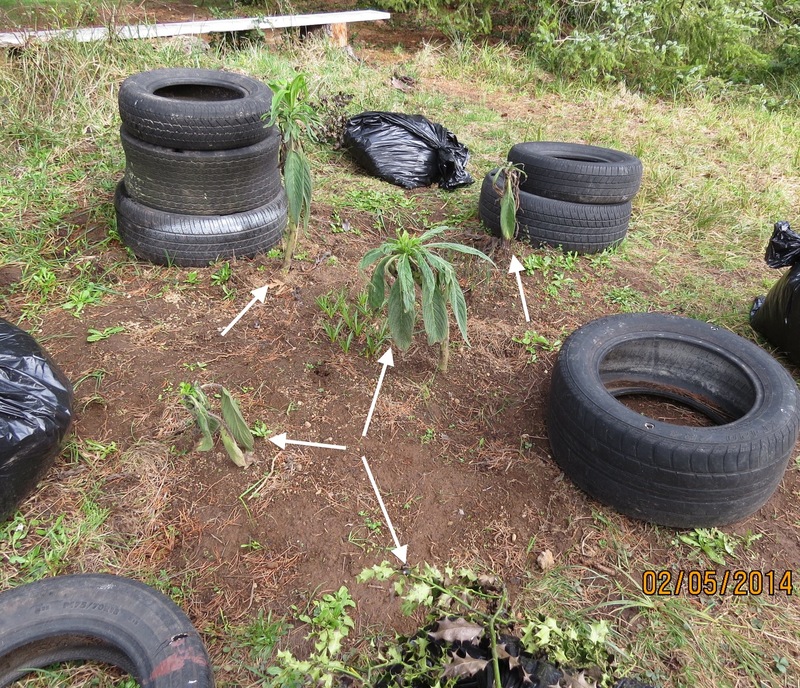 February 5, 2014…Five out of six have survived so far. These sub freezing nights are NOT helping. I cover them with blankets and a plastic tarp every night. 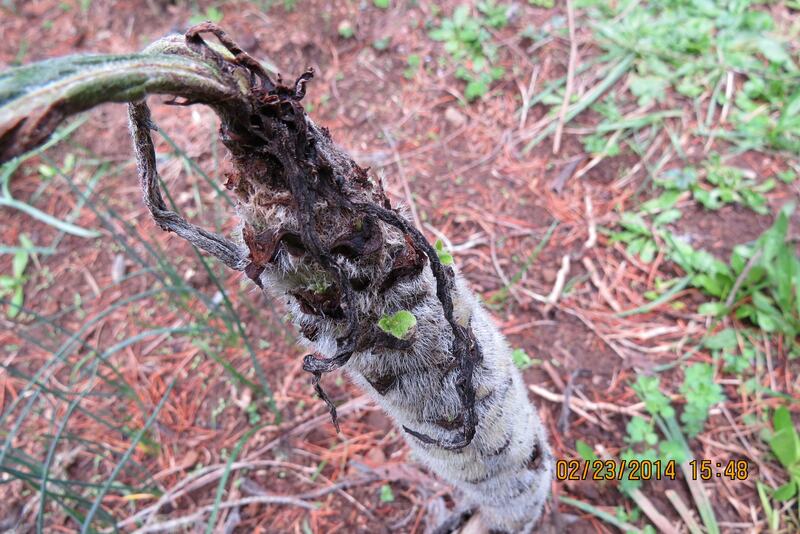 February 5, 2014…new growth means it’s still alive! More cold nights forecast so I’ve got to keep them protected. 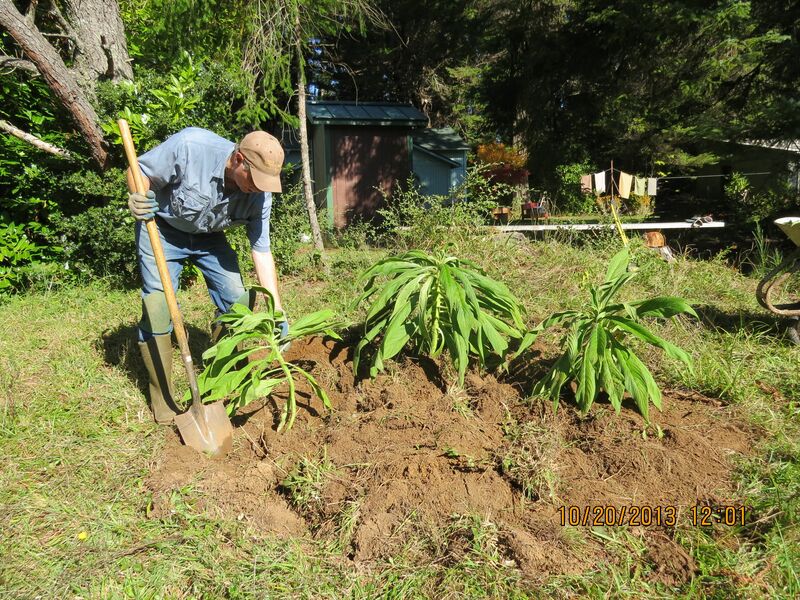 Feb. 5, 2014…These four echium in the backyard are slightly more protected. They were put here as a back up (Plan Bee). 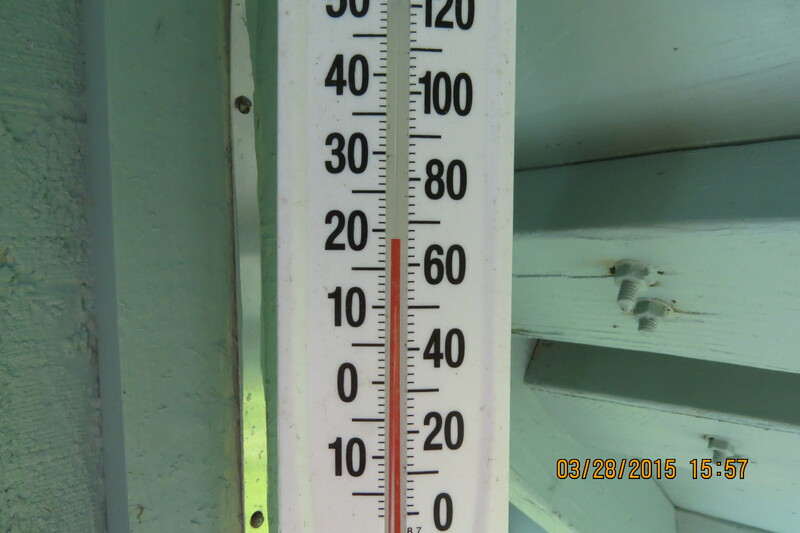 I didn’t think it was a very good spot because of the shade, but they are doing the best of the bunch. 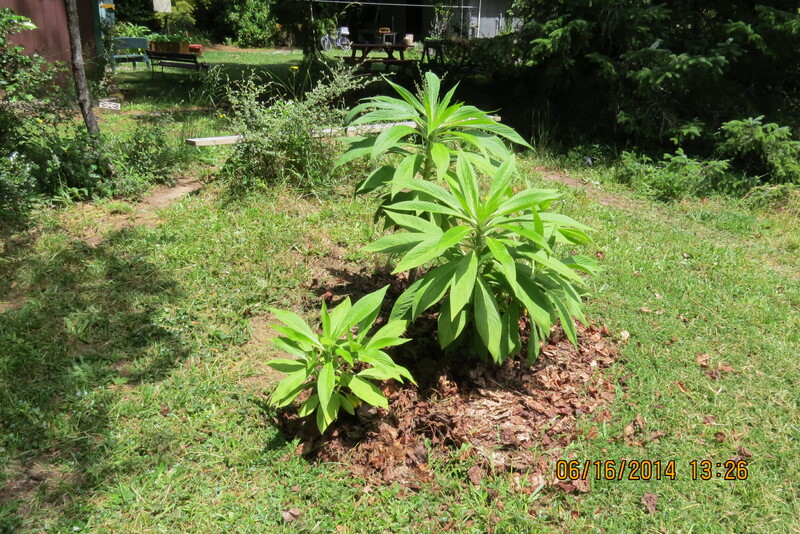 March 9, 2015…Is this the year the echium will bloom? I sure hope so. It’s putting on a spurt of growth. 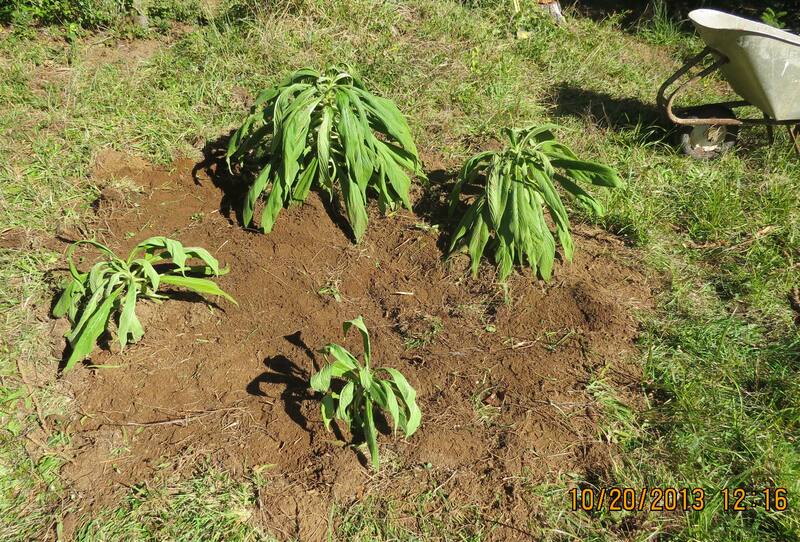 February 23, 2014…five echium still hanging on, barely. 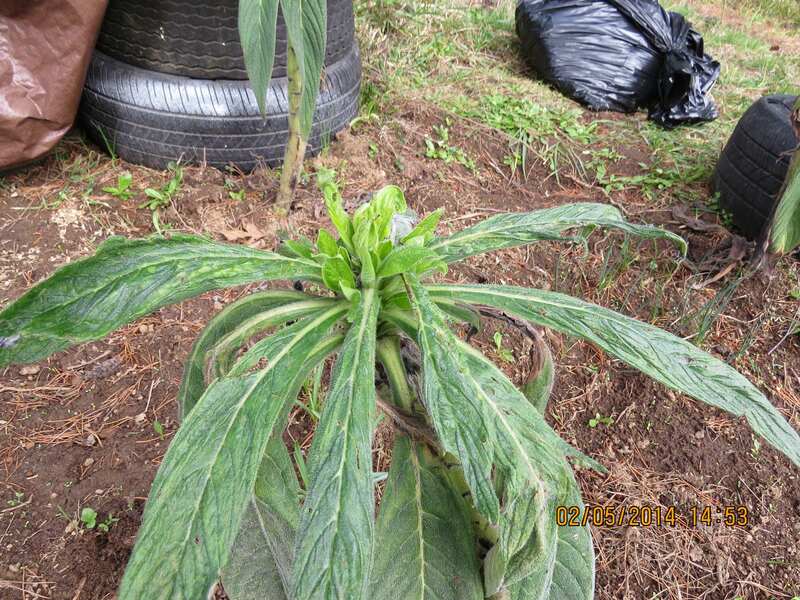 February 23, 2014…This poor echium plant suffered in the cold temps, but it’s still showing signs of life. Footnote…it didn’t make it. 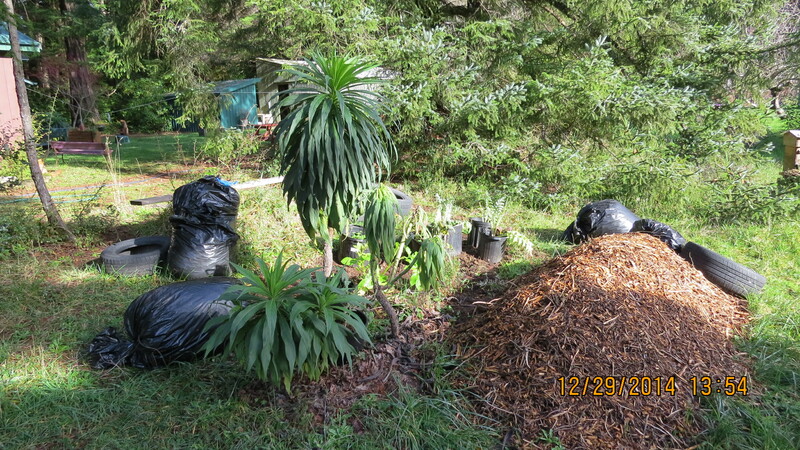 12-29-14…There are still 3 echium plants going into winter, although one looks a little sick. I wanted to shoot a photo before I covered them up with tarps prior to the big freeze this week. 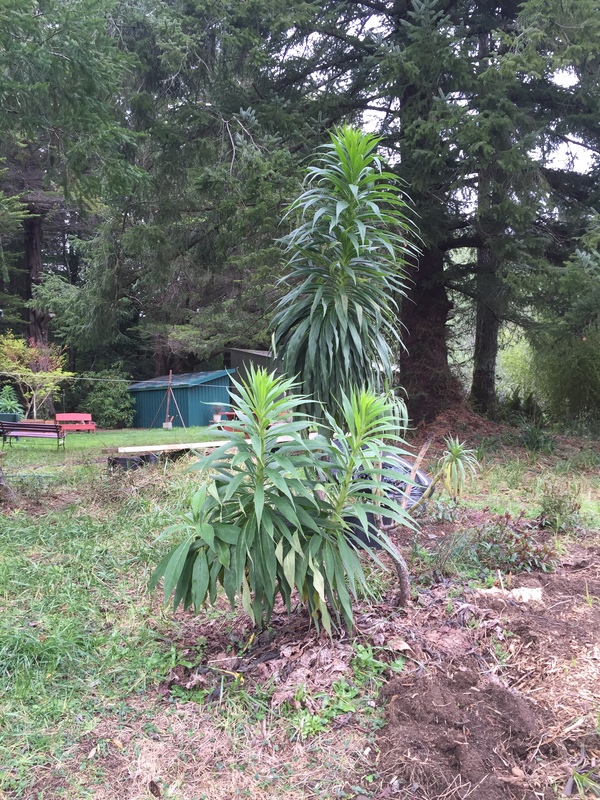 March 9…This echium has also been adding height. 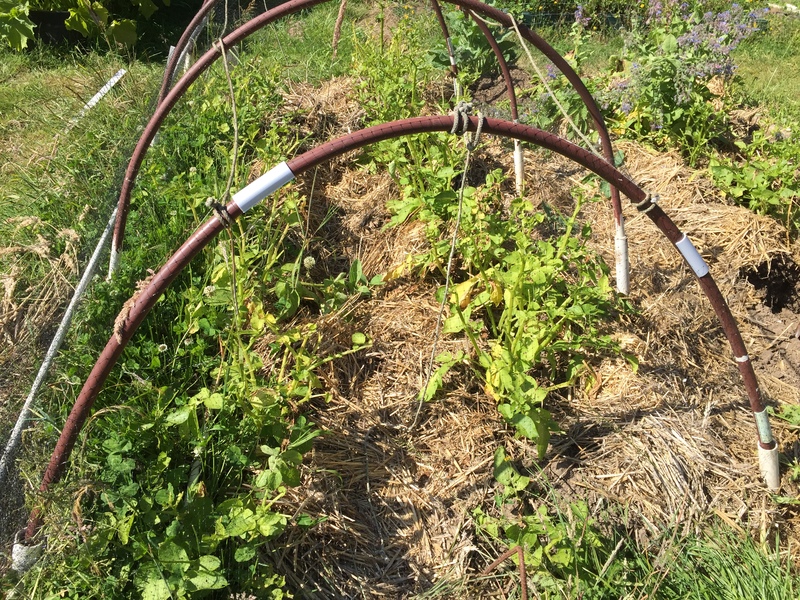 I started noticing it when I tried to pull the tarp over the top to protect it from frost. 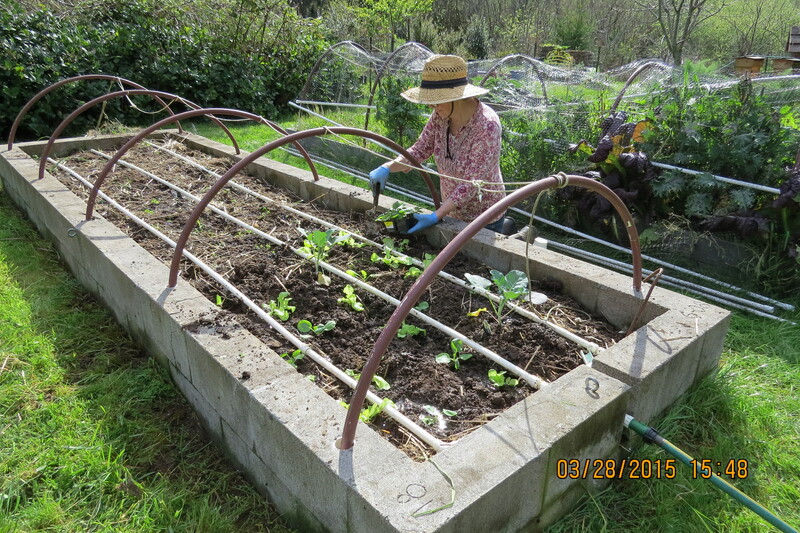 We haven’t seen any bud starts yet. 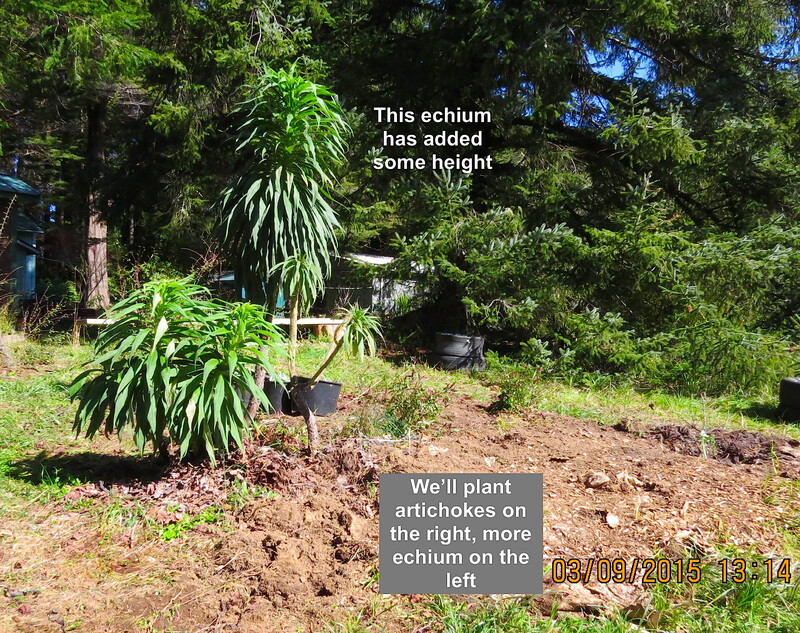 March 19…I just noticed the tallest echium (in the picture above) is starting to send out bud starts. Hooray! 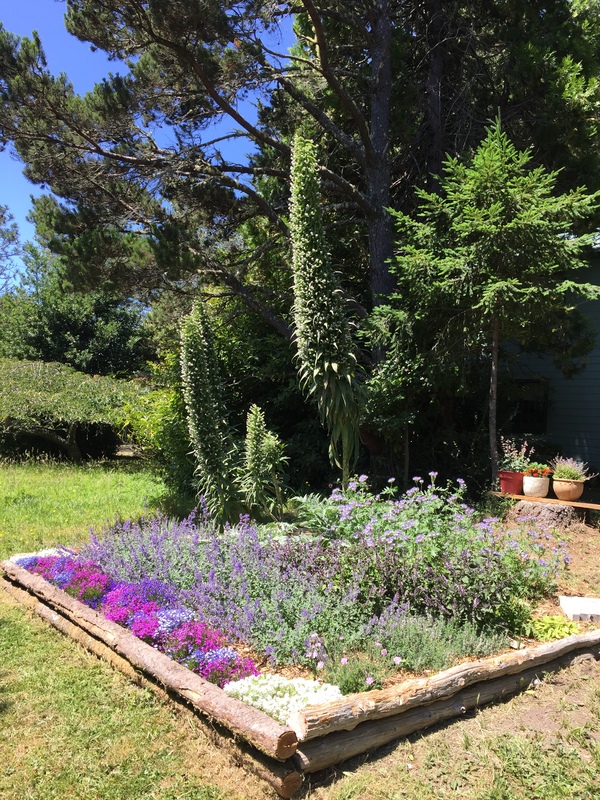 July 14, 2015…In the spring, we enlarged this bed and planted some bee-loving plants along with the Towers of Jewels echium plants shown in the background.